For Sunday 21/4/13 I was determined to beat my 38.5 miles barrier by basically doing the same route and extending it. During the week I’d fitted a new plastic spoke protector and felt quite confident I wasn’t going to suffer any issues which had also been the case in my previous 2 long rides. 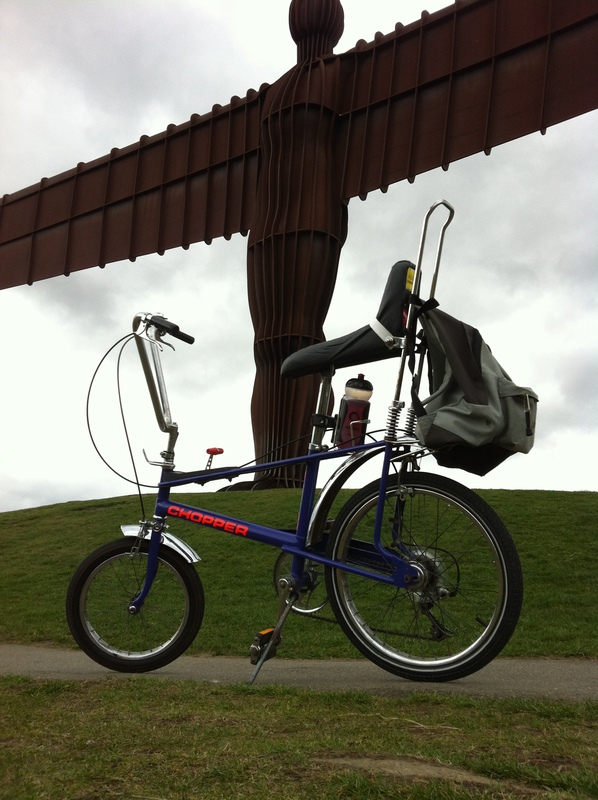 I arranged to meet Carl (one of the participants in our C2C adventure) at the Cycle Hub to ride with me at 10. I was going to get there (4 miles) with my next door neighbour (Dawn) on her bike as she wanted to know the route(she would then return home retracing her steps). Carl probably did 7 miles with me before having to turn around to head home for his lunch – I’ll make you ride harder next time!! So I was on my own heading down towards Tynemouth and then along to the lighthouse. It was very odd having to brake downhills and having to still pedal – where’s the fun in that? Once the rain eased off I headed back without further incident and eventually back to the cycle hub – there weren’t many cyclists out – I guess it was due t the inclement weather. To add the little extra few miles I’d threatened I headed up to the Angel of the North because I had an idea of a photo (see below) I wanted to take.